Yesterday was one of those Mondays where you take care of all the customer service issues for accounts. It all does work out well in the end. I did a bunch of errands in the afternoon and now I have to make the time to work on our taxes. Yep, it's that dreaded time again! Other than that, I saw this cute box somewhere on the internet and I can't remember where I saw it but I ended up making one. Just pretend there are easter eggs in that grass. I was so excited on Saturday when I stopped at Ben Franklin Crafts and saw this MS picket fence punch and I had my 40% coupon to use. I love this punch! And this one actually punches through cardstock. I have others that won't punch through cardstock. I also picked up some other new styles that they had in the store. 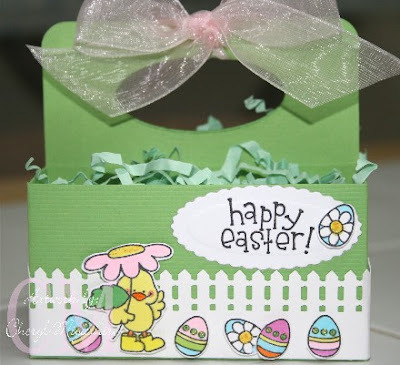 Back to the box, I used the new Easter stamps from Dandelion Designs. I don't know how Jean cuts out all her little images but I really had to use a magnifiying glass to color and cut. Haha! Here's what the box looks like side view. The other side is the same as the front of the box. Too cute yea? That little scallop is a Spellbinders petite scallop oval that I picked up from my husband's store. It was the perfect size to fit on the box. If you are attending the Ben Franklin paper party this coming Saturday, I'll bring the box with me so you can see it IRL. And while you're there, you can pick up the MS picket fence punch too. Thanks for stopping by today and hope your Tuesday is going great! And Happy St. Patrick's day!!! Cheryl - I love this box. It came out so nice. Do you know where the template came from? This is soo cute!! yeah, I just went to Js' last week. Hopefully we will see each other at the store! such a cute box! can you share the directions to make it? I would love to try it out! you did a great job decorating it...I better start looking for all of these cute punches! Happy St. Patty's Day too! This box is so darn cute!! I love that picket fence. Great job with the coloring of those darling images. Yes please share:0)! 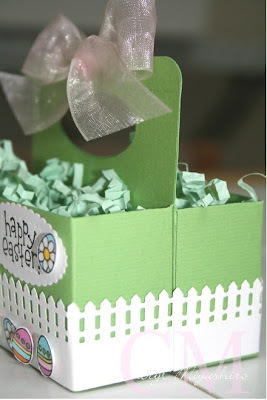 I want to try and make this one too, soooooo cute and love the picket fence. Everything is so cute about this box - and so green for St. Patrick's Day too! Wow! Love this box! Kind of reminds me of a flat version of the drink holder. The fence punch is so cute too!! Love the stamped images too!! See you on Friday...I must see this IRL!! I like this too cute..the picket fence goes so well with this project.Please do share the directions i wouldn't mind trying it out. Such a cute box! I just bought this punch before I left for my trip. Gotta try it when I get back. No wonder everybody wanted this box tutorial - it's sooo cute!! Love the picket fence!